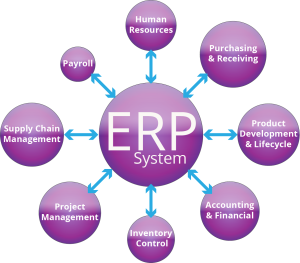 Blog What is an Enterprise Resource Planning (ERP) System? Enterprise resource planning (ERP) is a set of activities created to help you run your business. An Enterprise Resource Planning System is business process management software that allows you to integrate a number of applications for managing business processes, and to automate business functions. The goal of this type of system is to facilitate the flow of information throughout a company so that decisions can be data-driven. Executives frequently use the information to measure the achievement of key performance indicators (KPIs). An ERP system can impact any or all areas of your operations, from product or service planning and development to sales and marketing to client service and support. Although ERP systems ultimately streamline and automate many operations, implementing them involves a concerted effort from a team of contributors. Oftentimes business processes must be reviewed and revised, employees must be educated on the new procedures, and IT must get up to speed on issues around database integration, data analysis, reporting, etc. Cloud computing has been used in business for many years, but companies have been somewhat reluctant to have their mission-critical processes hosted there. However as the reliability and security of the cloud has become more apparent, ERP systems are increasingly cloud-based, entirely or in part. Solutions that have both on-premise and cloud components are referred to as “two tier” systems. ERP solutions are now available through mobile devices, allowing users to access real-time information on the go. Companies are warming to the idea of allowing critical business processes to be completed remotely. With a growing amount of a company’s communication with its customers taking place on social media, ERP solution providers are now adding social media modules to their offerings. ERP solutions help organizations manage data more effectively company-wide. While they are designed to be intuitive and to streamline operations, they are nevertheless powerful, flexible, somewhat complicated modular systems that require some forethought and dedicated resources to implement. However, the benefits are invariably worth the cost.